I directed my first commercial to help promote the production of The Amen Corner I directed at Pyramid Theatre Company this past summer. 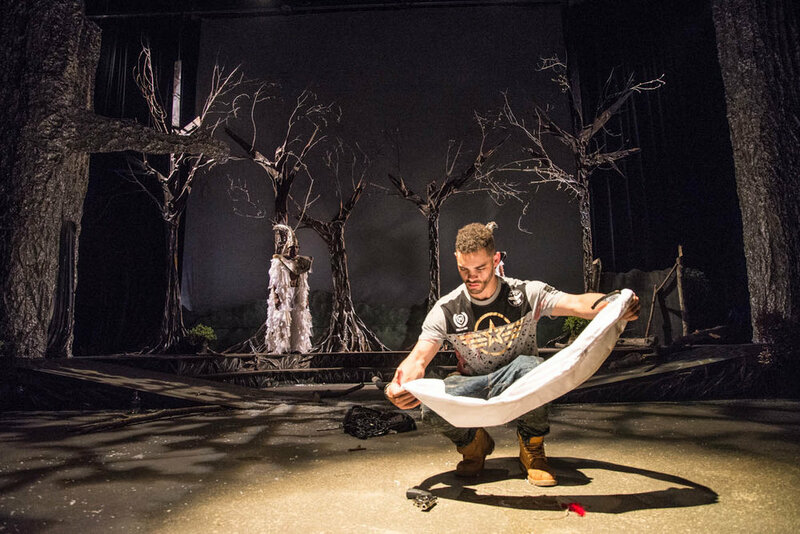 This past summer I directed Tripping Over Roots by Jaymes Jorsling at Rites and Reason Theatre and The Amen Corner by James Baldwin. 2017 was a crazy year I don't know even know where to begin in trying to describe it. I won't attempt to sum it up here. It was a difficult year filled with enormous personal loss and amazing professional strides. Here's to 2018 being just as thrilling! I've been a bit busy as of late. I think the easiest way to quantify the last few months is to share a few photos and a video. God is moving. 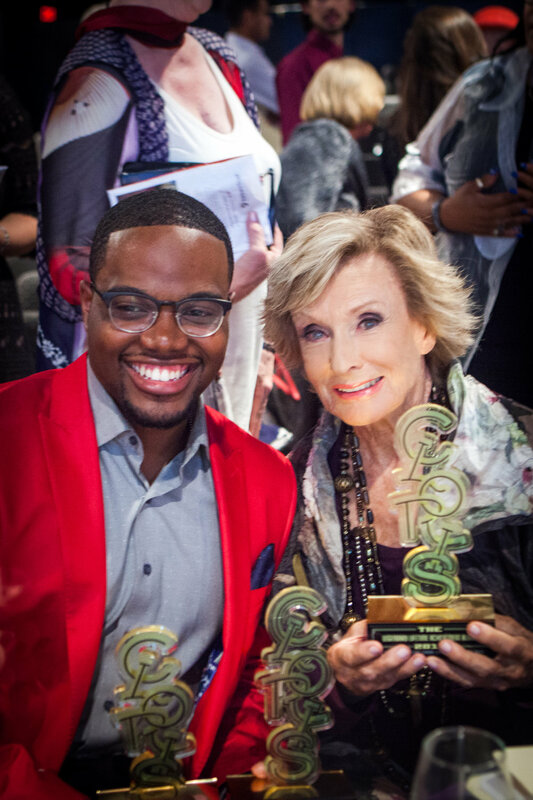 I was recently honored with the 2016 Cloris Leachman Excellence in Theatre Special Recognition Award and my production of A Soldier's Play won the 2016 Cloris Leachman Award for Best Play. I also got a chance to assist Anne Kauffman on Lorraine Hansberry's The Sign in Sidney Brustein's Window. 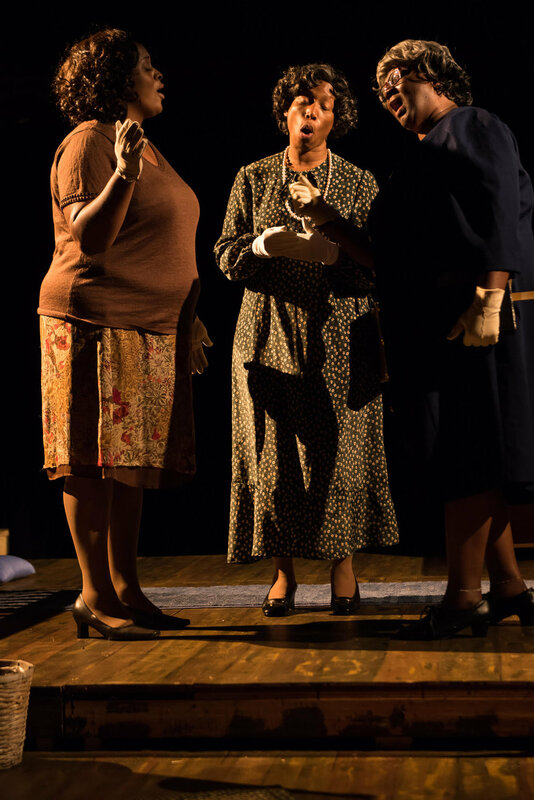 Check out the slideshow of production photos from the last nine months and listen to a radio interview I did with Lorraine Hansberry's sister, Mamie. I also included my acceptance speech for my Cloris Leachman award that includes some commentary on issues the Des Moines theatre community is facing regarding equity, diversity, and inclusion. On the evening that I was honored a group from the Des Moines Latinx Forum were protesting outside the theatre. I stand with them in their fight to end whitewashing in our theatre community. I have full confidence that those offending organizations are capable of rectifying it in the future. They must! This fall I will start work on my MFA in Directing at Brown University/Trinity Rep. I knew two years ago after I directed my production of Fences in Des Moines that I was done actively pursuing acting. The rush and exhilaration I received when that play opened in Des Moines for the first time was unparalleled. The opening night of A Soldier's Play further confirmed that my career was making a shift. I knew that Des Moines was where I wanted to continue creating art for the foreseeable future but I also knew I needed more training. My side-trip to the Goodman and now this next HUGE step of receiving more training at Brown University/Trinity Rep will allow me to grow as an arts administrator and artist so we can continue elevating art in Des Moines. I also hope to do more freelance work after I'm done with school. I am excited to start class in the fall so I can be challenged in new ways, but I'm equally excited to get back to Des Moines and Pyramid during the summers with a larger directing tool box. The first person I called when I found out I was admitted was my mother. There's nothing like a mother's prayers. In fact the only thing that may beat out a praying mama is a praying grandmama or two. Thankfully I had all three as I went through this admission process and I'm glad to see that prayer still works. The second person I reached out to was my little brother, Seth and my Dad. Those two were praying with me and counseling me along the way as well. You can always depend on family. The next step was sharing the news with my brothers in creativity, Jiréh Holder and Freddie Fulton. They are also two southern black boys who found their way to Ivy League institutions for graduate work in theatre. The support, words of encouragement, and prayers from those two are what gave me the confidence to apply for MFA programs in the first place. Then there's the rest of my Pyramid Theatre Company family, Nana Coleman, Tiffany Johnson, Claudine Cheatem, and Alexis Davis. I can't even begin to describe the prayer circles, the laughs, the tears, the arguments, and the love that we share. This is just as much theirs as it is mine. We are truly a family at Pyramid and this summer when you see Tiffany Johnson's production of A Raisin in the Sun that sense of family will shine through. Thank you to my Arkansas Rep family, and in particular Nicole Capri and Bob Hupp for their counsel and votes of confidence. Nicole keeps telling me to run for president one day and I don't plan on doing that but I know that she has ALWAYS believed in me. So thank you Nicole for telling me that I could do whatever I wanted. Thanks to my newly found Goodman family for letting me fall on the floor in the business office and cry the day I got the phone call. Thanks to my church family at Union Baptist Church back in Des Moines for being my family away from home for the last 8 years. God is just getting started and I'm humbled and excited for whats next. These people and communities are who/what contributed to this next step in my life. I'm sharing all of this because the general theme here is (you guessed it), Family. The reason I chose Brown/Trinity Rep over another option that I had was that you enter the program as an ensemble. I get to spend the next three years of my life with the same 15 people. I am excited and terrified by that, but I've learned over the years that whether you choose them or they come included at birth, family is family. I'm excited to join the Brown/Trinity Rep family this Fall! When I arrived at Drake almost ten years ago I remember vividly the first time I encountered a list of mostly Black plays and musicals on the back of the costume shop door in the basement of the Harmon Fine Arts Center. An upperclassmen saw me examining the list one day and quickly explained to me that it was the list of shows that Drake Theatre could never produce. The list included The Wiz, an August Wilson play or two, and A Raisin in the Sun. I don't know if that list is still there or not. I don't know who started it. People explained to me over and over again that it was made in jest of the fact that the school had so little to offer in terms of diversity. It wasn't malicious and I understood the humor behind it as the department made fun of itself. That didn't change the fact that I didn't find it funny and it pissed me off. I wasn't mad at Drake, I wasn't mad at the department, I wasn't even mad at the snickering students who thought it WAS funny. I was mad because I didn't want another Black student to ever see that list and accept it as their reality. I had to graduate from Drake, work in the Drake Admission office while moonlighting as a producer, quit my job, start a theatre company, and get on a lot of people's nerves but FINALLY I can say with full authority F*#@ that list! On Saturday, January 23rd, Pyramid Theatre Company announced it's 2016 season and I couldn't be more proud to say that we'll be producing A Raisin in the Sun at Drake University this summer. Presented in the Performing Arts Hall of the Harmon Fine Arts Center at Drake University. In April of 2010 I played Clay in a production of Amiri Baraka's Dutchman at this scrappy new little place called the Des Moines Social Club. It was my first gig in Des Moines outside of Drake and introduced me to the beauty of seeing something created from the ground up. The play was produced by the late Frank Burnette and the production changed my life. I didn't realize it then but that show would become the first time as an actor that I actually paid attention to what a producer did. The Social Club was still at it's old location on Locust and we were rehearsing on the third floor of this building badly in need of renovation. It was cold, there were animal droppings in the corner on the floor, and on the first day of rehearsal my director regaled us with tales of the homeless men and women who once slept there. I loved every minute of it. The following summer I was working as an actor in the Voices at the River Festival at the Arkansas Repertory Theatre and got a chance to meet and briefly work with one of Baraka's contemporaries, Ed Bullins. He was quiet the day he came in unannounced to watch me rehearse a monologue from his play In the Wine Time, but I'll never forget his approving smile. I performed that monologue at a gala honoring him a few days later and his wife told me afterwards, "He doesn't speak much but he said you got it." That summer is when I realized that telling stories reflective of my Blackness was more important to me than just telling any story that came my way. During that same festival I met another playwright named Tearrance Chisholm. I sat in on rehearsals of his play, Liddy’s Sammiches, Potions & Baths, and I remember identifying strongly with his use of language and his characters. He was only a few years older than me and is also a fellow brother of Kappa Alpha Psi Fraternity Inc. so naturally I promised myself that I would work with him one day. This summer I'm producing a developmental production of Tearrance's play Hooded; or Being Black For Dummies at the Des Moines Social Club. I've never been shy about sharing my belief in God and specifically my belief that every thing happens for a reason. I don't take any of these moments lightly and I'm happy to see things come full circle in my life. Here's to another summer filled with new stories to be told and lessons to be learned. Presented in the Kum & Go Theatre at the Des Moines Social Club. This past summer after an urgent phone call from my director and executive producer I had to make the last minute decision to hire a plain clothes police officer to provide surveillance at the opening night performance of A Soldier's Play because a racist coward had made a concerning, harassing, and potentially threatening phone call to the theatre in protest of our show. The play was selling decently at the time and we had some successful previews under our belt but the reviews still hadn't ran and we had a lot more tickets to sell to ensure that we recouped (which thankfully we did). Plus my personal credit cards had taken a hit with last minute incidentals that a certain demanding lead producer (me) insisted were needed for the show to be a true success. As my grandmother would say, "The Devil was busy." The police determined there wasn't an immediate threat and the show went on but we hired the officer as a precaution. I've never been more afraid to step out on a stage. Nervous? Sure. But in a time when another hate filled tragedy seems like it could be just around the corner it was terrifying. Fuller's words as they fell from my cast's lips seemed to carry more weight with each scene, but by Act II when my character bellowed, "I'm not afraid of white men" in Scott Siepker's face there was all at once a peace and a fire that filled my insides. I decided that evening that I had to keep doing this kind of work in the city that I had reluctantly come to call home and I needed to do it full time for that matter so that it had all of my attention. Two weeks later the show had closed, Pyramid had officially formed, and I was offered my current job at the Goodman. Click on the photo below to read the Des Moines Register article about the founding of my new company.